Let the collections at Tweed Regional Gallery & Margaret Olley Art Centre and Old Government House capture your imagination. Boggo Road Gaol and Captain Cook Memorial and Lighthouse will appeal to history buffs. 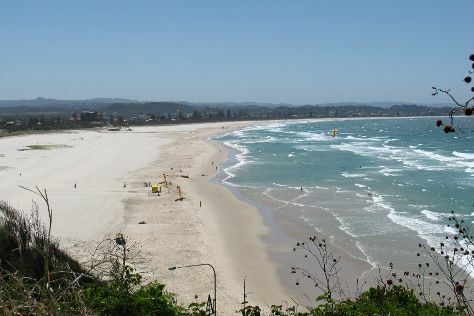 Explore Brisbane's surroundings by going to Caloundra Lighthouses (in Kings Beach), Coolangatta (Kirra Beach & Saint Augustine's Catholic Church) and Kings Beach (in Caloundra). There's still lots to do: kick back and relax at Maroochydore Beach, get your game on at South Bank Parklands, examine the collection at Queensland Museum & Sciencentre, and take in the spiritual surroundings of Catholic Old St. Stephen's Church (chapel). To find where to stay, reviews, traveler tips, and other tourist information, you can read our Brisbane trip itinerary builder tool . Sydney to Brisbane is an approximately 4-hour flight. You can also do a combination of flight and bus; or drive. Expect a daytime high around 30°C in April, and nighttime lows around 19°C. Finish up your sightseeing early on the 15th (Mon) so you can go by car to Cowes. Your cultural itinerary includes sights like Phillip Island Grand Prix Circuit and National Vietnam Veterans Museum. Step off the beaten path and head to Phillip Island Wildlife Park and Churchill Island. The adventure continues: identify plant and animal life at Koala Conservation Centre, admire nature's wide array of creatures at The Nobbies Centre, make a trip to Amess House, and get in on the family fun at A Maze'N Things. For ratings, more things to do, maps, and tourist information, use the Cowes trip planner. Traveling by car from Brisbane to Cowes takes 21 hours. Alternatively, you can do a combination of train and taxi; or do a combination of train and bus. In April, Cowes is a bit cooler than Brisbane - with highs of 23°C and lows of 12°C. On the 19th (Fri), wrap the sightseeing up by early afternoon so you can drive back home.